Awesome! You should get years of service from that setup. Thanks for sharing it. Thanks Dave, I hope that Your prediction comes true ! Thanks for looking. WOW! What a great, hardworking station! I think I know where you’ll be found. Enjoy. That’s an awesome setup..you should be proud of that piece. Great work !! Thanks for the comments fella’s, appreciated !! WOW!! That is so nice! Nice job, I like the station. I have Triton as well. I had the same on as you then upgraded to his big brother. Great machines. Enjoy! Good work! So many tool so little time. I like that you developed this idea from your own needs and research and made it your own. Rob, the fence looks great. 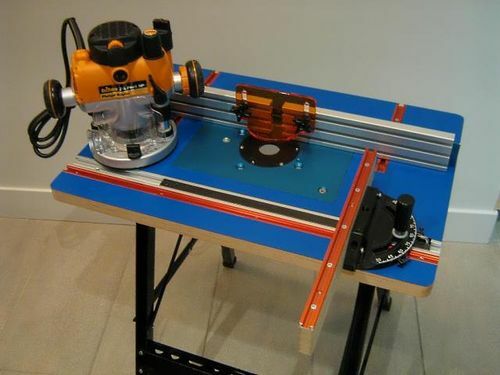 How do you like having the router table / outfeed table combination? I thought of doing this since I have limited room in my shop, but I wasn’t sure how much of a hassle it would be to have to move the fence when I wanted to switch. I also thought it might cause problems if I wanted to leave the router set up while I made another cut on the table saw. I’d love to hear how it has worked for you. Thanks Dr. ken and like You (smaller scale, LOL) I am slowly putting together a work space I can make my own and have a feeling of accomplishment and perhaps one day find myself in a dream shop such as Yours ! Thanks again and Happy New Year !! A great looking router table very well done.